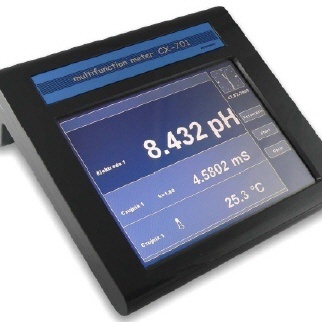 Elmetron CX-701 zeer uitgebreide laboratorium en veld meter. Pdf field equipment CX-701 [684 KB] download. kinds of function windows chosen by the user are displayed. CX-701 may be used in laboratory and also in the field after placing it in a special case with rechargeable batteries (option). The rechargeable batteries allow for continuous work in the field from 8 – 15 hours. The time depends on the kind of chosen measuring functions and settings of the screen etc. (function chosen as the main one). - The pH, ions, oxygen and conductivity inputs isolated one from another. - Automatic or manual temperature compensation. - Additional information given as pop up windows and voice statements. - Automatic control of the electrode’s membrane condition. 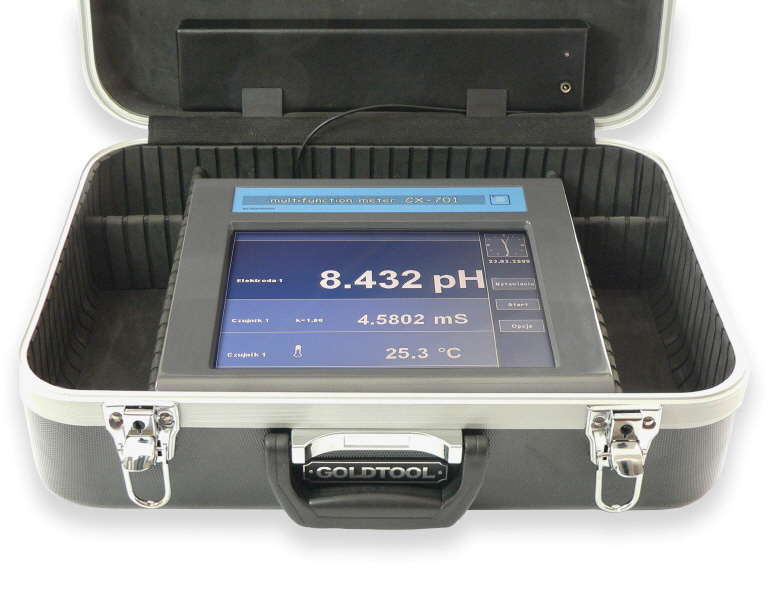 • The whole measuring range enables measurements both of ultra pure water and very salty solutions. • 6 ranges switched automatically. • Works with conductivity cells equipped with platinum electrodes. • Calibration by entering the constant K in range 0.01÷19.999 or in buffer solution. • In the memory possibility of storing of 3 constant K of the cells which cover whole measuring range. • Wide range of α coefficient 0÷10 % / °C chosen depending on the measured solution. • Possibility of changing the reference temperature. - In ion meter the molecular weight of measured ion is automatically introduced. - Automatic conversion of the units – ex. M/l to mg/l or pX without the necessity of manual conversion. - possibility of entering freely chosen standard solution value. 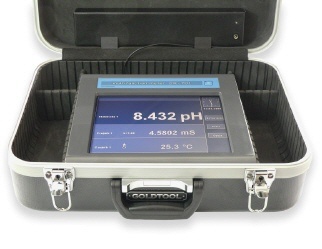 - Air pressure measurement with automatic calculation of the air pressure influence of the oxygen measurement. - Calibration of the oxygen sensor in 1 or 2 points. - Precise ORP (redox) measurement (accuracy 0.1 mV). Other features:• The results are stored on the 2GB SD memory card, the number of collected data is practically unlimited. • Storing of measurement’s results with time and date, taken as single or series with set time interval. • Possibility of storing results of all simultaneously measured functions. • Unlimited number of the stored data sets. • Possibility of transferring the collected results from the SD card to the PC for further work out. • The results and calibration data are stored in nonvolatile memory. • Internal clock with date. • Powered with 15V power adapter. • For the field work the meter is integrated with a special suitcase with rechargeable battery set (option). • The meter meets the GLP requirements. • 24 months of warranty.